Neither column supplies any evidence, even anecdotal, to support the claim that envy is rising, or even that it has ever motivated public policy. Mullainathan expresses deep fears that American policy is being driven by “a misguided belief that the economy is a zero-sum game and that reducing the position of the top one percent automatically improves everyone else’s.” But neither column quotes a politician at any level expressing any such belief. (At least the Times’ dubious monocle trend story identified actual human beings who possess monocles.) It’s not even clear why they imagine such a thing would be possible — in a system that requires candidates for any major office to spend hour after hour courting wealthy donors, and which virtually guarantees they themselves will join the one percent immediately upon leaving office, who would ever want to personally impugn the rich? The closest we have come was a brief upsurge in populist anger for a short period of 2009, following news reports of bonuses handed out to employees at bailout recipient AIG. The House of Representatives (by a vote of 328 to 93) passed a 90-percent tax on those bonuses. But the Obama administration opposed the bill, the Senate forgot about it, and the moment passed. It’s notable that even this small, ultimately ineffectual moment did not rise from any generalized spate of envy but specific resentment against the use of tax dollars to reward failure. It is true that the Obama administration has called attention to income inequality (which, unlike envy, can be proven to be on the rise). To define inequality as a problem implies, theoretically, that lowering the living standard of the rich makes others better off. One could devise policies that reduce inequality — nuking Martha’s Vineyard, or covertly scattering poisoned truffles at The Four Seasons — by harming the rich without making life any better for the rest of us. No such policies have made it onto the national agenda. Under Governor Bush’s tax cut proposal, he would spend more money on tax cuts for the wealthiest 1% than all of the new spending that he proposes for education, health care, prescription drugs and national defense all combined. Now, I think those are the wrong priorities. 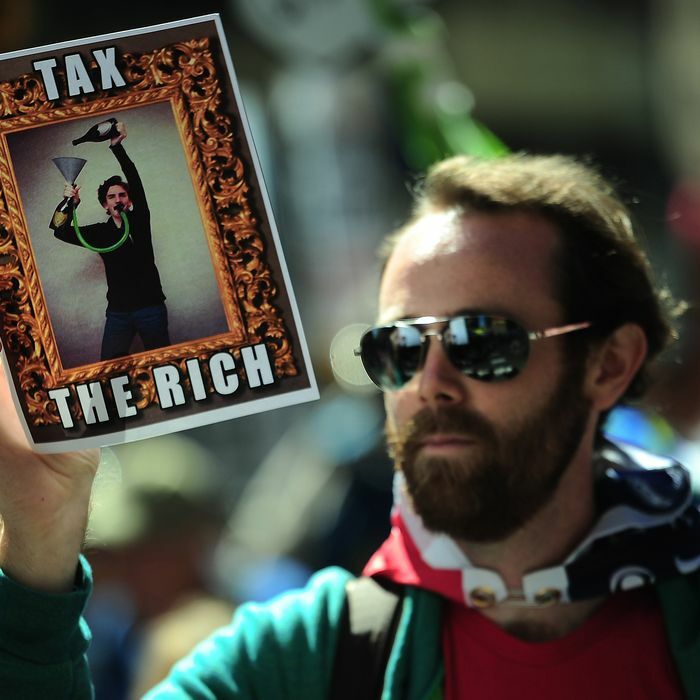 The highest 1% of income-earners in America got $89 billion of tax cut[S] last year. One percent of America got more than the 80 percent of America that earned from $100,000 down. Bush thinks it’s more important to fight for that top 1% than to fight for fiscal responsibility and to fight for you. Gore, Kerry, and Obama were all making the exact same point: Clinton-era tax rates for the rich needed to stay in place not because the rich needed to be punished, but because cutting those rates would create more painful alternatives, like higher structural deficits or cuts to necessary programs. 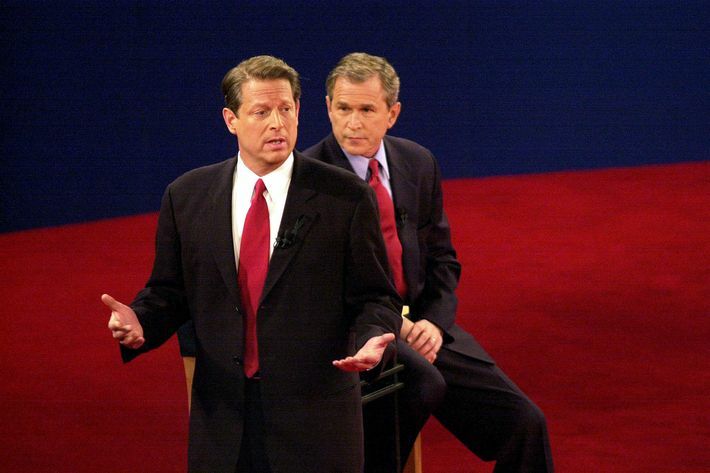 One argument against this claim is that Clinton-era tax rates will slow economic growth — an argument Republicans made feverishly when Clinton proposed the higher rates in 1993, almost as feverishly when Bush proposed his cuts eight years later, but with diminishing enthusiasm since the Bush economic record capped off a mediocre recovery with an epic collapse. As it has grown harder and harder to depict the Bush tax cuts as an economic spur, some conservatives have argued that higher tax rates on rich people are simply wrong, regardless of economic effect. (That is the case made by Greg Mankiw, who is, ironically, an economist.) The moral defense that the rich are entitled to keep their earnings, never terribly popular, foundered when the economic crisis highlighted the least sympathetic slice of the upper-income stratum. Mitt Romney’s 47 percent video dealt it another grievous blow. In the absence of either a usable economic rationale or a usable moral rationale, what remains is a generalized anxiety on behalf of a statistical category that has slowly emerged as a social class, “the one percent.” The mere invocation of this class somehow feels aggressive and threatening. The backlash against “envy,” while presented as an expression of dispassionate calculation, is actually a kind of superstitious fear.